The guy's over at USBfever.com have recently given 360-Hq the opportunity to review their “EasyCap USB 2.0 Video Adapter with Audio” which can be used to capture video from composite or s-video sources, including the Xbox 360. To start the review I will first explain what exactly the EasyCap is. If you are on the 360-Hq Homepage click read more to read the full review. 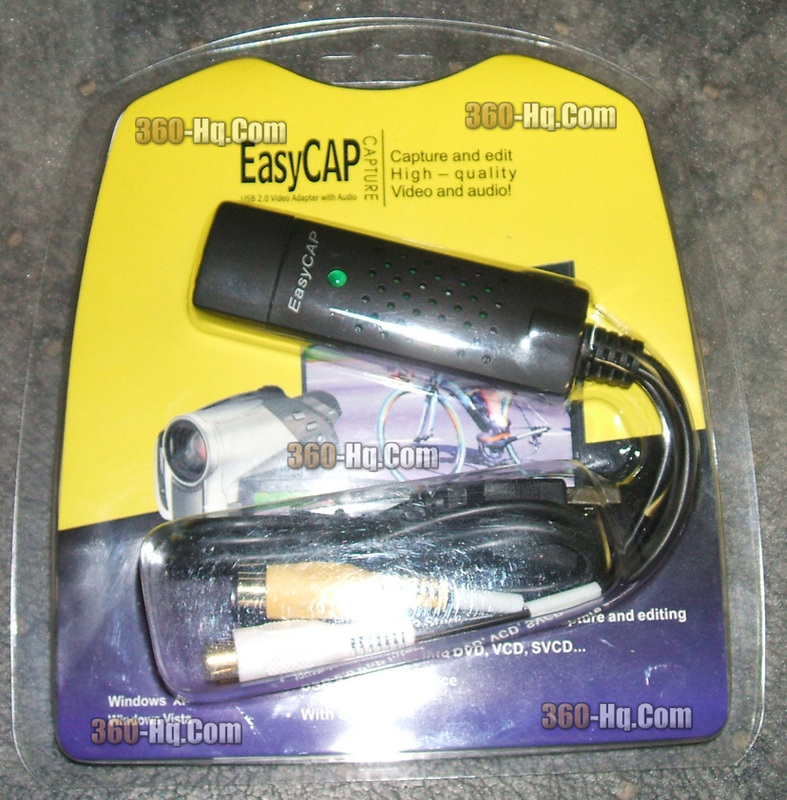 The EasyCap is a USB 2.0 video/audio capture card which lets you capture audio and video from an external source (Xbox 360, TV, DV Cam, etc...). 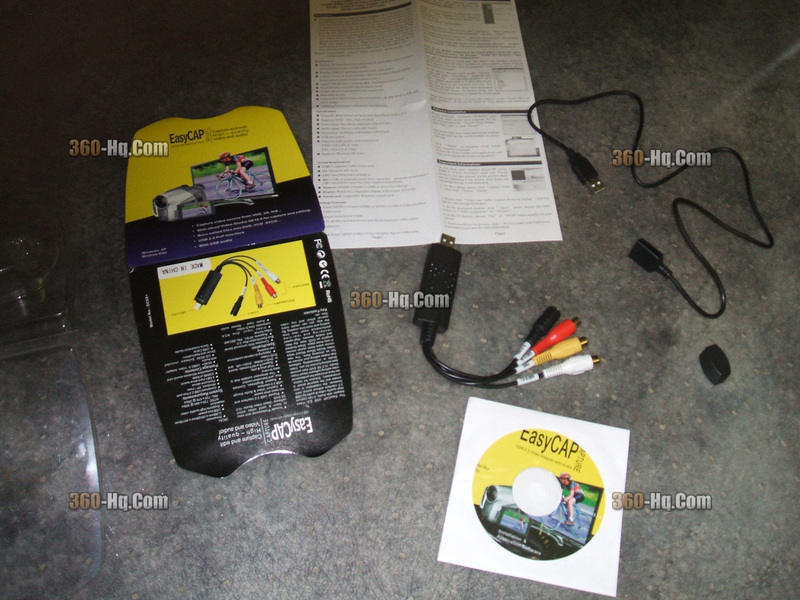 The EasyCap capture card supports Standard Definition (480i, SD) video capture, so anything you can get from composite (also known as RCA) or S-video cables. So in essence the EasyCap is taking what used to be an internal PCI card into a portable small USB device. When I first opened the packaging I was quite surprised that there were very little instructions. Upon reading them further I decided that no more instructions were necessarily needed as EasyCap is described as a “Plug n Play” device. Even then you shouldn’t really need instructions as set-up was as simple as installing drivers and software. After playing around with the EasyCap for a few hours I realized that you could even use the EasyCap capture card to play your Xbox 360 on your computer screen, although it won’t be great quality you could do it. I did not find any lag when capturing or even on standby with the included Ulead Video Studio, although when going into other video recording programs (such as Virtual Dub, Windows Movie Maker, etc) a bit of lag was introduced, so if you want to use other programs be sure to have some y-splitters so you can play on your TV and record on your computer. During my testing with the EasyCap I found that the included Ulead Video software wasn’t great quality, but thought it might have something to do with the compression settings. So when I tested the EasyCap on VirtualDub which includes Divx/Xvid encoding I found the video quality was a lot better. If you are using the EasyCap to capture home-videos or TV then it is best to use a different program then Ulead, if the video is bound for an online streaming service like YouTube the Ulead is great quality. Although this may not be the highest quality option or comparable to High Definition (HD) it is a great affordable option for someone who wants to capture TV, home videos, or their best gaming moments. Build Quality: A sturdy USB device, with a thick casing. The gold plated connectors are a great inclusion to help increase quality. Video/Audio Quality: Great quality for how small of a device it is. Not the same quality as a high end PCI capture card but it is very comparable. For professional video capture this will leave some to be desired, but for your standard “YouTuber” or Gamer this will be a dream. Contents: It comes with everything you will need to capture video, and the inclusion of the USB extension really helps get to those hard to reach places. The inclusion of y-splitters would have made this product even better than it already is. The Video Editing software is pretty basic but with a bit of time you can get some neat effects. Ease of Use: Very easy set-up, and still easy to set up to your DV cam or Xbox. To get the desired quality takes a bit of mucking around with the settings, trial and error helps.